Sauvage restaurant was the most unique restaurant in the world today, it was a stone age style restaurant, it means all the meal preserved at this restaurant use no sugar, no salt and no other seasoning. the dish on this restaurant was made entirely of ingredients which our Stone Age ancestors would have used You can only enjoy our hunter-gatherer ancestors more than two million years ago. 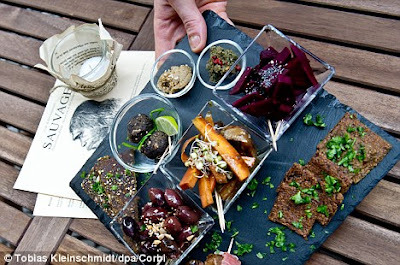 So are you ready to enjoy this Paleolithic cuisine at Sauvage restaurant in berlin? This restaurant also became the first restaurant in europe that solely serve the caveman diet menu, Many people said that the Caveman Diet or Paleo diet was the best way to lose weight, despite a report claiming it was ineffective. Sauvage, which is also the French word for 'savage' or 'wild,' is part of the Paleolithic diet movement and claims to be first of its kind in Europe. That means serving only organic, unprocessed fruit and vegetables, meat, fish, eggs, nuts, seeds, and herbs. The truly obsessed build an entire lifestyle around the concept, mimicking caveman-era exercise. This can involve lifting boulders and running barefoot, with some even emulating the blood loss they believe Stone Age hunters might have experienced in pursuit of their dinner by donating blood every few months. But guests at Sauvage can try 'Paleo' without feeling obligated to take on a strictly Stone Age lifestyle. 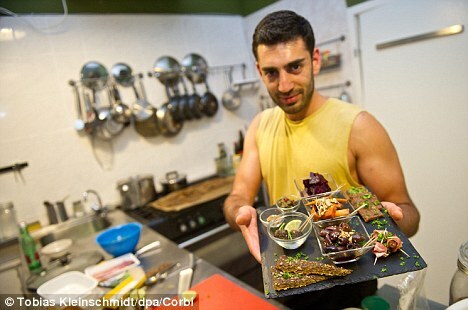 Sauvage's Boris Leite-Poço told Spiegel Online of the growing interest in caveman cooking. He said: 'Many people think the Paleolithic diet is just some hipster trend, but it's a worldwide phenomenon, with an online community that spans the globe. The menu includes salads with olives, capers and pine nuts; gluten-free bread with nut-based butter or olive tapenades; smoked salmon with herb dressing; and other various meat and fish dishes. Gluten- and sugar-free cakes, like a spicy pumpkin pie, are available for those Stone Age diners who don't want to skip desert.